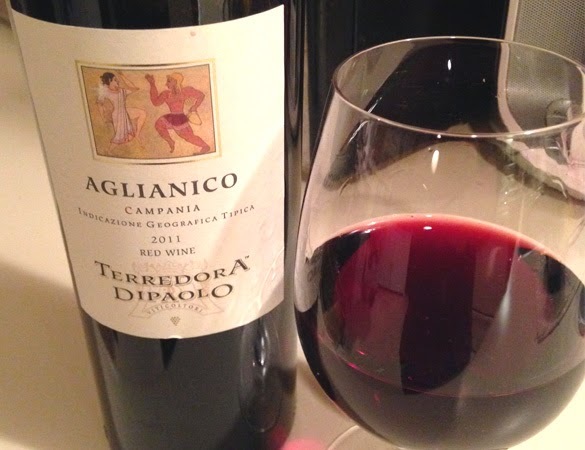 Somehow I find myself writing about Aglianico for the second time in two months on this blog. If you've never heard of the Aglianico grape or would like to know more (much more) then please help yourself to my blog post on the subject: The Adventures of Aglianico - A Complete History of an Ancient Wine. Towards the end of that post I bring up Terredora di Paolo Taurasi. The wine I'm reviewing is the lower tier of that wine. This is Aglianico that either doesn't qualify to carry the Taurasi DOCG or is from anywhere within Campania, Italy. 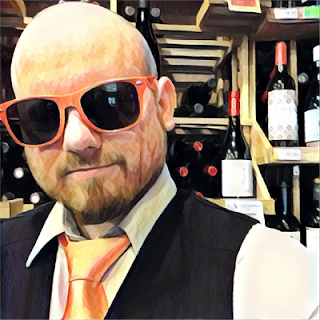 Terredora di Paolo Aglianico is going to run you about $16 while the Taurasi will hit you with $34. First of all the label is just balls. I don't know if those two Greeks are doing the Safety Dance or if they're fighters in an ancient Mortal Kombat but I'm all about classy throwback labels. The color of the actual wine is a beautiful dark cherry red... but still there's not much density. You can see right through it without much effort at all. The nose immediately reminded me of Spanish Tempranillo. It's very earthy, muddy, mulchy, cedary, with just a tad bit of cigar. Those aromas just give me nosegasms. Well, not as much as tomato leaf and black olive but those aromas aren't even on this wine... I digress. There's also quite a bit of licorice and raspberry on the nose. Raspberry is also the doorman on the palate, the first to greet you and let you in. After that it gets very plummy with brown spices and dried herbs. It's medium bodied but the tannin is very much present. The acidity also makes itself clearly known. It finishes with iron... how badass is that to say? "It finishes... WITH IRON!!!" Awesome. It finishes with iron, tart cherry, black table pepper, and a dry mouth from the tannin. This is a food wine. Not as much as their Taurasi, which I feel needs food for its quality and attributes to be fully appreciated. Sure, you can drink the Aglianico all by itself and it'll still be enjoyable, but it'll be much better when you drink it with some lamb chops, veal parmesan or a Florentine steak. So would I buy this again? Yeah, I would. The price is right for my wallet, I have blood ties to Campania, I really enjoyed this bottle, and I love to cook the kind of foods this wine was born to be paired with. I can guarantee I'll be bringing a bottle to family gatherings come the holidays. Would I feel comfortable recommending it to customers? I'm not going to recommend this to the common "I'm looking for a good red wine" customer. That's not a knock on them. I've got outstanding stuff for them but they won't be diggin' this one. It will definitely become an option I recommend, among Bordeaux, for somebody looking at lamb or veal pairings. And it will be the lead option for somebody seeking a one night stand with an interesting alternative to Cabernet or Merlot. Also, there's been a surge of people asking for Campanian wine here so I don't feel the slightest bit worried about carrying this. This is a winner. It's not a Big Papi grand slam, but it's a winner.